Spotted in a release of Samsung's Galaxy Wearable app for Android, a single landing page points to a new sports-centric Galaxy Watch model, two fitness bands and a pair of wireless earbuds called Galaxy Buds. SamCentralTech was first to publicize the accidental disclosure in a tweet late Thursday. While specific product details are unknown, the leak references a 40mm Galaxy Watch Active that appears to be a successor model to Samsung's Gear Sport. The watch is consistent with the firm's existing designs, sporting a round watch face, two pushbuttons and what looks to be a stainless steel chassis. Interestingly, the Active does not appear to incorporate a rotatable bezel, currently one of the main control schemes for Samsung's Galaxy Watch interface. A pair of fitness bands called the Galaxy Fit and Galaxy Fit e are referenced as a pair, suggesting both models will share a design featuring a long rectangular screen and rubberized buckle strap. How the Fit differs from the Fit e is unknown. Finally, Galaxy Buds seem to be an evolution of Samsung's existing Gear IconX wireless headphones, deleting or repositioning one external microphone port and potentially doing away with the latter's silicone wingtip stabilizers. According to the latest rumors, Galaxy Buds might be capable of wirelessly charging from the back of an anticipated Galaxy S10 smartphone. The wearable lineup could be announced at the upcoming Galaxy Unpacked event on Feb. 20, where Samsung is widely expected to introduce a new flagship Galaxy S10 and reveal an as-yet-unnamed foldable phone. Galaxy earbuds might be there product to match the removal of the 3.5mm audio port on Galaxy phones this year. Not saying its going to happen, but between 2016 and now Samsung seems to be the only smartphone maker that has kept it still standard. Is this going to be the poor mans Airpods & Apple Watch?? The numbers of the watch face are italic but why is sat italic and steps not? Makes no sense. You don't care? Well I do. Details… Samsung almost never pays attention. You know, I don’t recall the last time I saw a Galaxy watch, but they do tend to be snapped up on bargain websites. Also, before the usual bagging out the AirPods’ stalk, without it, these things look like hearing aids. So cool. Good eye, and spot-on comment. LOL. You beat me to it. That was my first thought. Shamescum. Always copying and confused about who to chase. I give them credit for not copying the Watch completely. Let's see how long they can keep the act up before realizing people don't like non-Apple designed tech. 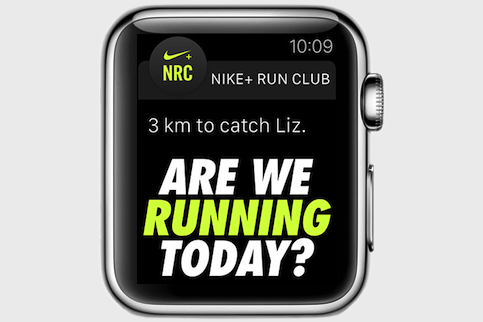 They practically lifted the “running man” Workout app icon from Apple Watch. Such amazing innovation and originality. Gosh, why does that watch screen look so familiar (completion rings, rings behind arms watchface, running man, and the Nike colors).... Have those clowns not one original idea in their head? So... the same old crap, different day? They've been doing this forever. No surprises here.